DUMA KEY combines the appeal of CELL and LISEY'S STORY - two of Stephen King's most successful hardbacks of all time - to take the legendary author to a whole new level. DUMA KEY is the engaging, fascinating story of a man who discovers an incredible talent for painting after a freak accident in which he loses an arm. He moves to a 'new life' in Duma Key, off Florida's West Coast; a deserted strip, part beach, part weed-tangled, owned by a patroness of the arts whose twin sisters went missing in the 1920s. 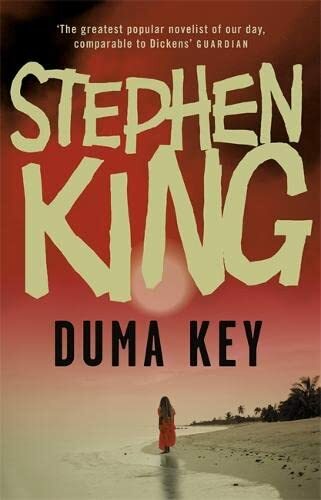 Duma Key is where out-of-season hurricanes tears lives apart and a powerful undertow lures lost and tormented souls. Here Freemantle is inspired to paint the amazing sunsets. But soon the paintings become predictive, even dangerous. Freemantle knows the only way forward is to discover what happened to the twin sisters - and what is the secret of the strange old lady who holds the key? The story is about friendship, about the bond between a father and his daughter. And about memory, truth and art. It is also is a metaphor for the life and inspiration of a writer, and an exploration of the nature, power and influence of fiction.